I did it! I made Miss A’s quilt! It’s so adorable! My first attempt at a Bargello Quilt turned out alright! It’s not perfect, but trial and error, right! It was my first stab at making a Bargello quilt, so if you look closely the edges are not perfect, and yes, it is a little annoying, but it’s okay. I’ll fix it with the border. I hope I can anyways. I already showed it to Miss A’s mom, and she adored it, so I hope Little Miss A will love it just as much! So, I’m done for the night, and will put the border on tomorrow. I was thinking about doing a border of solid purple. Yes, that sounds right! Woo hoo Congratulations Eric. 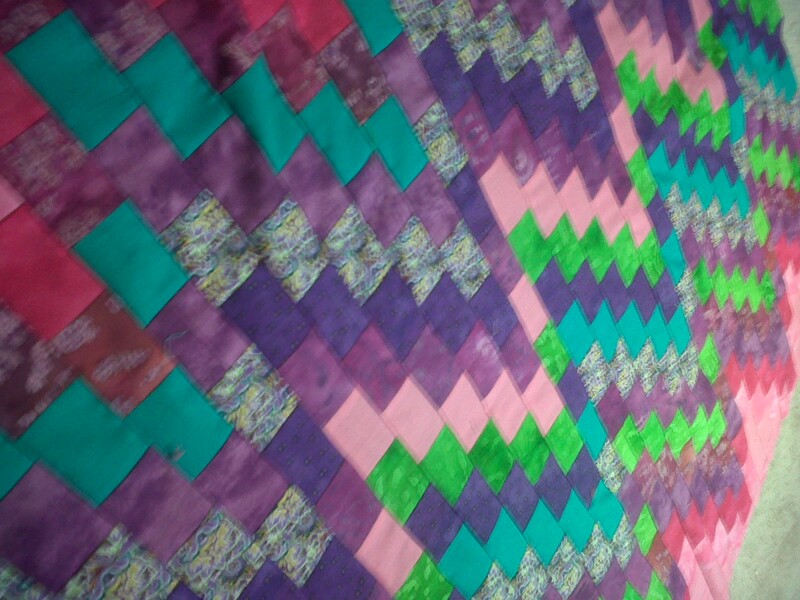 Your Bargello quilt looks really good.and I’m sure Miss A will adore it! I’ve never been a big fan of Bargello quilts . . . until now. I really love the way you put this one together. Beautiful ‘girly’ quilt!! Your quilt inspired me and I am making one now, with no pattern. Fabulous! Send me pictures when it is done!! !